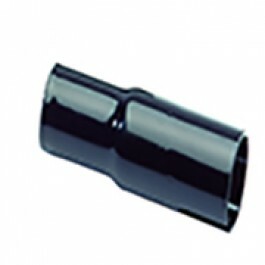 Extension to suit black "T" Piece, Each extension adds 43 mm to the height of the Tee piece. It features two mounting frames that are permanently installed onto the outer wall of your RV, plus easily removable ventilation grills for upper and lower. 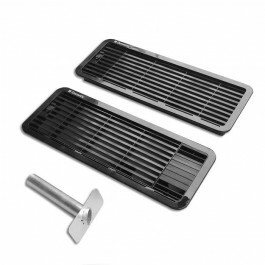 The lower grill lets fresh cool air in, while the upper vent has two outlet sections. Both cut-out holes should be 451mm wide and 156mm high. Very happy with the item delivered to the door would highly recommend. Hassel free will use site again and would recommend to friends and family. "Thanks my generator for the great service in shipping this product after the delay. " Installed and working well so far. The heat in the West will really test it. HAPPY Camper. Replaced an old RM2350 90ltr fridge with a new and same model fridge. No adjustments necessary. Painless and prompt. Was advised when there was a delivery delay, not left hanging. Good to be kept in the loop. This new unit is a replacement for the same model which has stood the test of time, 10years in fact and travelled extensively in that time. Well done keeping us informed with the order and delivery process My Generator. "Very pleased with the value and performance of my fridge"
Currently FREE with the Dometic RM2350 Fridge is a Dometic 8 Litre Vehicle Cooler / Warmer! Dometic RM2350 90 ltr 3 way refrigerator. Manual control model. Absorption refrigerator for 12 volts, 240 volts and gas. Singlecurved door models, 550 mm wide. The slim size for old and new campervans. Reversible door (hinge can be either left or right handed). 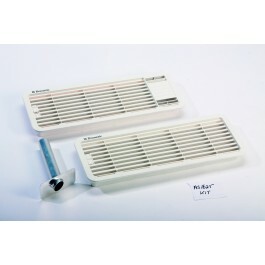 Well proven classics: the smallest RV absorption refrigerators ever built. A perfect fit for the tight kitchenettes of most campervans, old or new. For recommendations on appropriate fitting accessories to go with the refrigerator (and advice on optimal ventilation set-up), please click on the below INSTALLATION GUIDE. Absorption 3 way refrigerators need to be installed and certified by a qualified and licensed gas-fitter, as improperly or illegally installed products will void the manufacturer’s warranty, and could pose a safety risk. While 3 way absorption fridges have the ability to run off 3 different power sources (12V / 240V / Gas), they are primarily designed with gas operation in mind; they provide exceptional efficiency when running on gas. However for 12 Volt operation, this is only recommended with absorption fridges when the vehicle is running, otherwise it can exhaust your 12 volt power source (battery) very quickly. There is no exterior door skin. The door is silver coloured coated foam, with black plastic trim. A laminate panel or ply must be fitted to the door to match your decor (not supplied with fridge). See RM2350 image below which shows an example of front of door with out laminate panel installed. Front silver flashing comes manufactured with creases as part of the door material (see image below). Therefore a laminate panel is required. 240 Volts, 12 Volts; 175 Watts. Gas; 13.5g/h. 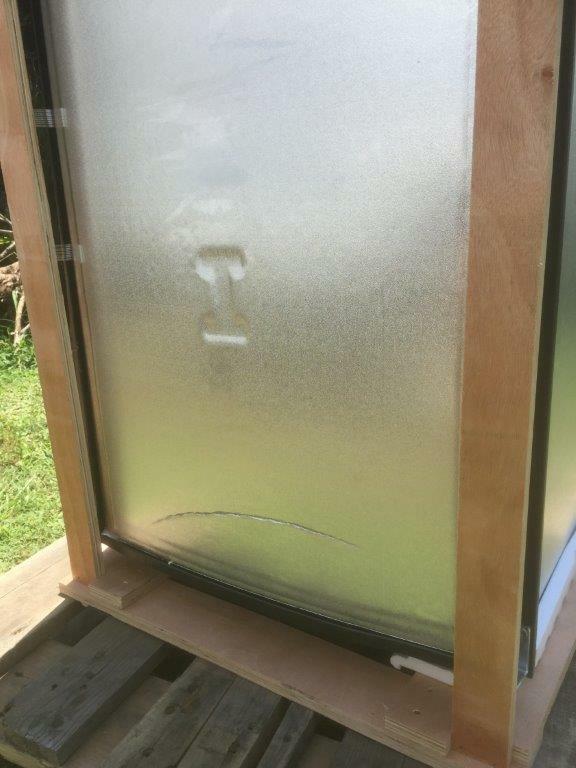 There is no exterior door skin. The door is silver coloured coated foam, with black plastic trim. A laminate panel/ply can be fitted to the door to match your decor. Gas operation with manual ignition thermostatic control for 240 volts and gas. Wide metal mounting flanges for built in application - no exterior skin. Top mounted controls. Needs to be installed and certified by a qualified & licensed gas-fitter. Incorrect install will void warranty. Ensure you also refer to the Manufacturer Installation Guide / Product Manual for recommended ventilation set-up for optimal fridge performance. Easily purchased. Review by Barry Johns	, Toowoomba QLD. Brought a new 3 way fridge for the caravan, looked at a few the Dometic fridge we brought was the best value. The fridge just slipped straight into our 2000 jayco like a glove. Very easy to fit and connect ,easy to use it didn't take long to cool down. And it was fantastic on 12volt while on the move. Would l recommend the Dometic fridge yes definitely. Shopping experience with my generator.com well what can l say it was second to none. As living in W.A l was expecting 10 days delivery from QLD .I PURCHASED it on Saturday afternoon on line. We was going away following weekend so we was going to take car fridge. I got email from the company l would have the fridge on Thursday didn't believe it,so wasn't expecting it until next week. Thursday morning 8.30am knock on the door blow me over the fridge was here thanks for the prompt delivery we had a working fridge in the van ready for our trip. Fridge will be installed in a few weeks, but should be OK.
Great friendly staff always willing to help. No amount of inquiry was a problem. This is a great product, and hopefully will last a long time. Buying through my generator has now and in the past been positive. Have had it fitted, works great. So far the fridge has worked a treat Haven’t tested it on a long trip but all’s good so far. Easy to use plenty of information. Received my fridge and bonus 12v cooler promptly. Fits exactly into the space where the old fridge came out. Not sure about the locking latch, fiddly to open, but sure we will get used to it. Received my fridge within a week. Free shipping. My Generator were very efficient. The quality of the fridge is excellent. My Generator prices are the best I found after extensive search and other quotes I received. The item was shipped and received within a couple of days. It was good to be able to speak with people. Fitted it in the caravan now i have a fridge that works very well thanks. Great fridge. Fitted into old space easily though had to get it in through window in caravan. Easy to deal with. Very friendly and helpful. Postage on website said free but was charged. However quick delivery to Tasmania. Any absorption fridge will not get as cold on 240/12v over GAS, but performs exceptional on GAS. The quality of the fridge is great and fits perfectly as a replacement in my OLD 82 Millard. They were fantastic, Ordered Tuesday night was promised delivery on Friday, and was not disappointing. The courier backed the truck up at 4:00pm Friday, ready to leave on our camping trip on the Saturday morning. Excellent little fridge, currently on a trip to Alice Springs and hasn’t missed a beat on any of the power/gas options. Fit straight into existing space of old RM2300 3way. Great product and excellent shipping time, had new fridge within 3 days of ordering. Very easy to shop and deal with your company. This fridge was easy to fit into the caravan in the same spot as the previous Dometic fridge and looks good, and more importantly works well. The fridge was easy to order and we were very pleased with the delivery time especially as we are in the country. Very pleased with the whole process. Thankyou. Fit straight in the spot the old Electrolux came out of. Works a charm. this is a very well built fridge works perfectly fits perfectly the fascia is very neat. Absolutely excellent, a pleasure we will be doing business again for sure. They were very knowledgeable and forthcoming with all our queries, not shy of backing there guarantee in writing cant fault them, seriously. We are very satisfied with our Dometic 3 way fridge. It is as advertised, we have installed and run the appliance and it functions perfectly. The sales response was excellent, the delivery time was excellent. Fridge is great replacement for our over 20yr old electrolux, controls so much easier to use. Customer service is brilliant, very helpful, delivery very fast. So happy with our new three way fridge. The other fridge died just before Christmas. New one arrived in time to have it installed so we could go away for Christmas break. The staff I spoke to were very helpful. Product arrived in good order. Have not had the chance to use it for long yet, but it seems it will do what we need it to. Amazing, ordered on Monday, arrived at door Wednesday morning. Thank you for the prompt and efficient supply of our recent three way fridge for the caravan. It was promptly installed and we had a wonderful trip up North. Your help has been very much appreciated, as we were on a very tight schedule. I have no hesitation in recommending your firm to friends. We needed to replace our 21-year old Electrolux RM2310 which had been part of our domestic stand alone power system but which had stopped working properly. Compared to our old model, the dimensions of the new Dometic RM2350 are the same, so it fitted into the existing cavity, but the controls and gas valve are at the top, so new plumbing was needed, and the front door needs a slightly higher, slightly narrower, and slightly curved panel, but not so much higher and not so curved that I was not able to use the timber panel I had had made for the old fridge. Like most things, the new model is made in China, but it seems to be working as well as the old one ever did. After 21 years, there was no longer a local supplier, so we decided to shop online. This was our first time buying something so expensive online, so we were cautious, but we are happy to recommend My Generator. I put the order in on Thursday and the fridge arrived the following Tuesday, even off a dirt road and up our long drive through the bush. With new one installed we went away and work really good. Very happy with the product. The delivery being very swift and delivered to my work place as we live out of town Recommend this fridge and brand to anyone who needs to replace there fridge . Thank you for a great product. Very impressed with the company and the staff who help me. Great Fridge. It didn't miss a beat on our recent trip. Awesome site, easy to navigate. Best price, best warranty and fantastic service. Service was great, thank you. Great product. Just what I was after, great price. Easy to deal with. It was delivered right on time. After shopping around I was happy to come across My Generator. We saved over $200 & are totally happy with our purchase. Installed & working a treat so it's back on the road fir us. Would definitely recommend you guys our experience has been great. Easy & fast free delivery was great. Thanks again. I found the product excellent value for the money. Review by Cheryl Bryant	, Hervey Bay Qld. The fridge is an upgrade from my older model it is easier to adjust controls and more efficient. All connected up & working well! The price and freight free delivery meant it was the cheapest one I could find. would do well to emulate. The fridge is exactly what we need to replace in our older caravan. Fitted perfectly and is working a treat keeping everything nice and cold. Shopping on this site was so easy. The fridge was delivered really quickly and the price was super competitive. Fridge installed with the greatest of ease, and performs perfectly, I placed a glass of water in the freezer, and the next morning it was frozen solid, just like a good fridge should do. It works perfectly regardless of which energy source you use, Gas, Mains or 12V. I am 73 years old, and I can honestly say that I have never had a better experience when buying something from a company. Not only was my deal handled in the best possible way, but they went went out of their way to make sure that I was happy with on-time delivery for the item that I ordered. I would deal again with this company in a heartbeat, they provide the type of service that the buying public should get. Well done. I am extremely happy with the new Dometic fridge that is replacing a previous one that was 18 years old. The new one has controls at the top which is so much more convenient than the lower controls of the old one. My experience with My Generator was one of great service. I ordered a new fridge and was later told that the one I ordered was not available at the moment but that I could have a more expensive model for the same price. When it arrived I found that it needed a permanent 12 volt power supply to run the electronics. Unfortunately my van does not have a home battery, so Sean said no trouble just repack it and he would arrange to have it returned at no cost to me. Later he could supply the original fridge that I ordered. I was most impressed with the friendly and trouble free service I received. Thanks My Generator. my new fridge is fantastic, is easy to use due to the controls at top of fridge rather than at the bottom like my previous fridge. Shopping was a breeze, and delivery was great as fridge was delivered to Roma free of charge. Good quality. Great product. Works a treat. Will definitely deal with this company again. They let me know of a short delivery delay, and everything happened as they said. Gets much colder than the old one - even freezes the ice. The service I received from My Generator from the first contact until the fridge was delivered was first rate. The dometic fridge I bought was delivered so quick I was so surprised when the truck arrived with it. Had it installed and working in 2 days and its been working ever since and perfectly happy with how it is going considering we have been having the hottest summer on record . Would recommend My Generator to any one thinking to purchase the products they sell, the service was great, will be my first place to look when wanting something else. Great product. Arrived in perfect condition in very short time. This is a replacement fridge for us and we used it for the first time on the weekend and we were amazed at the efficiency of the product. It looks really good and is easy to use. We are looking forward to having ice cream from this fridge! Installation instructions, especially for fitting the front panel could have been clearer. However, I went to the warehouse in Clayton and they were very helpful. Good product, good service. My Generator were very helpful with the delivery and actioned our change of delivery date with no problem. Perfect for our caravan and the Dometic suited our needs. The old Dometic finally passed away after many years of service and long hard roads. After a bit of a fiddle with the door panel the new one fitted straight in no problems. We bought the fridge on line with no troubles. An amazing delivery time of two days. I am most impressed with the Dometic 3 way Fridge Freezer 90 L. It is a very quiet appliance and is just the right size for our camper van. I am even more impressed with the service from My Generator. Speedy, prompt delivery with in a few days of ordering. Thank you.Top appliance. Pleasant delivery man was most helpful in helping move my purchase from crate to camper van. Purchased in April 16 Review by Robert Crump	, Ingham Qld. The service and delivery was excellent. The instruction book could be more detailed. The cover panel for the door could have been supplied with the fridge. But happy overall. The experience was very positive. The person I dealt with was very helpful. Dometic is the leading brand when it comes to caravan 3 way fridges. A change in design required some re-modeling exhaust for the gas but all in all it works a treat. The help that we were given when and during the purchase of this product was exceptional, as we had to return the product as it was damaged during transport, the guys got us a new one fast, as it was almost Christmas, thanks very much. 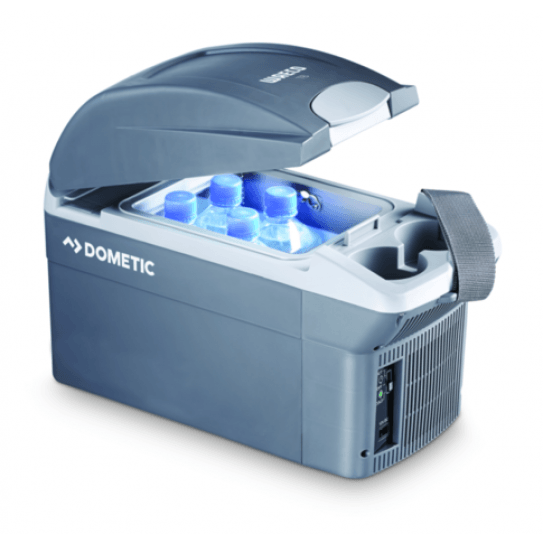 Q:Does the Dometic Fridge range come with all parts needed to install and operate? Hi there, an upright Dometic 3 Way Fridge requires correct installation and ventilation to ensure optimum performance and safe operation. You can see listed on the product page under the Accessory List there are Vents and Gas Flue kits required as part of the installation. On the INSTALLATION GUIDE document, you can see what recommended vents and gas flues go with your particular sized fridge. For customers buying a Dometic fridge to replace their existing one, they often already have the required installation accessories (vents and flues) and may not need to add them to their fridge purchase. Thanks. Hi there, good question - the Dometic RM2355 is an 'AES' model, standing for Automatic Energy Selection, which enables the refrigerator to automatically select the best energy source available. The Dometic RM2350 is the slightly cheaper base model which requires manual selection between each energy source. Q:With regards to the Dometic Waeco Upright fridge models. Can I choose which side of the door the hinge goes on? Some models require the customer to choose a hinge position prior to delivery. You will notice a Left Or Right Hand hinge option on the product page. 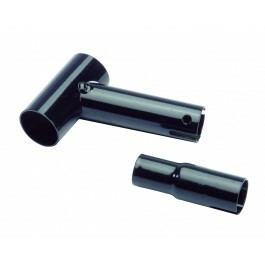 With all the other models you will be supplied with a hinge conversion kit. The door will come with the hinge on the right hand side as standard. You can easily change it over using the kit. Feel free to view the Installation instructions on the product page for each model. Q:I am traveling to Darwin and I have heard that some 3 way fridges are better than others at performing in tropical climates with very high ambient temperatures. Which one of these models is “T” rated? Thanks very much for the inquiry. Climate Class Ratings for 3 - Way Fridges are a hot topic (pun intended). The European Union (CEN) fridge performance standard is becoming increasingly accepted and the main rating that caravan enthusiasts look out for is the “T” rating. SN and N (sub normal and normal) - are designed and rated to work up to 32 degrees C.
All of the Dometic [RM] range of fridges are T - Rated, Except the RM2350, RM2355. Hi Paul, there is no external door skin; the fridge allows for a laminate panel or ply to be fitted to match your interior décor if you wish. Q:Do you require a 12v DC power supply to operate fridge on gas or 240v mains power? Not all Dometic RM models. Models such as the RM2350, RM2453, RM2553, RM4601 are manually selected to gas and have a push button ignition which means they do not need a 12v electrical connection ie they are manual ignition. They reduce gas flame to a pilot flame when not needing to cool further/cycle off and increase flame when they do. On the other hand all MES - Manual Energy Selection , AES - Automatic Energy Selection & UES (Selectable AES & MES modes) all require a 12v feed to give basic function even on AC power. One of the things this enables is the engaging of the gas supply and the ignition of the gas. The MES/AES/UES models disengage gas supply when cycling. When cycling back on the gas supply is engaged and the ignition automatically & electronically engaged. Q:Hi, how many amps does the fridge draw per hr on 12 volt? Hi, the manufacturer's power consumption specifications for this model are: 175 watts power draw on 12Volt and 240Volt. Just be aware that 3 way absorption fridges are most efficient when running on gas as a power source. They are designed with this use primarily in mind. 12 volt fridge operation for absorption fridges are only recommended when the vehicle is running, otherwise it can exhaust your 12 volt power source (battery) very quickly. Remember this when your vehicle is parked and turned off! Q:What are the dimensions of this 90 litre 3way fridge? HWD ? Q:Does this come with hinge kit to change to left hand? Yes this Dometic Fridge has a reversible door (hinge can be either left or right handed) and includes a kit for you to change which side the door hinge is on. Most of the Dometic [RM] range of fridges are T Rated. The RM8501, RM2355 and RM2350 are ST Rated. The measurements include the frame around the fridge. Please refer to the cut out dimensions for the cavity size requirements.